There is no doubt that money is one of the biggest stressor in our life. And it’s obviously not an easy task to manage your personal finances as well. It’s not enough to say “Oh, I’ll spend less today”, then magically you don’t waste a penny this day. I’m sorry to burst your bubble but that’s not how it works. In fact, many people make decision to buy something just based on their emotion at that time. Even worse, most of them don’t even actively keep track of their finances. Or if they did, they might waste a ton of time and take a huge of mental effort to track what they did spend or feel confused about how to plan for both short and long-term savings. It becomes one of the main reasons which lead to a “Rat Race” situation. For those who don’t get what Rat Race is, according to Urban Dictionary, it’s a term used to describe a frustrating, hard-to-break financial lifestyle. With this in mind, we gave Song Nhi birth. Using advanced technology such as AI, OCR, NLP, Song Nhi is a friendly intelligent virtual financial assistance which has the potential to help people manage their personal finances efficiently and intuitively through many major chat application like Facebook Messenger, Siri, OK google, Skype, Slack. 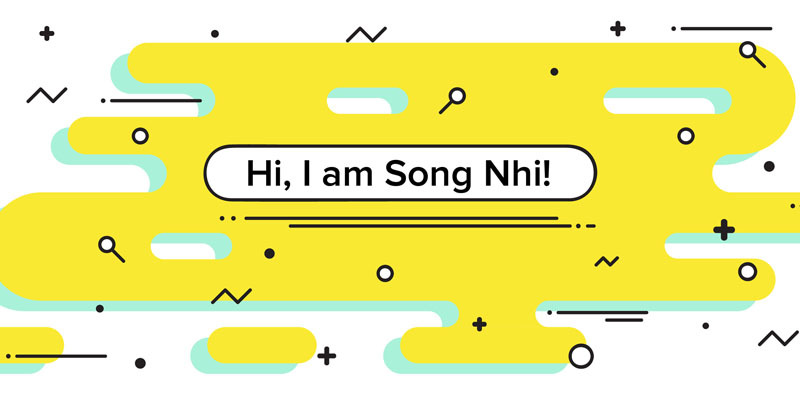 By providing a user-friendly conversational experience, Song Nhi is not just an average bot but the one that can understands and produces language naturally. You just need to talk to Song Nhi via text or voice as you would to a friend. Awesome, right? 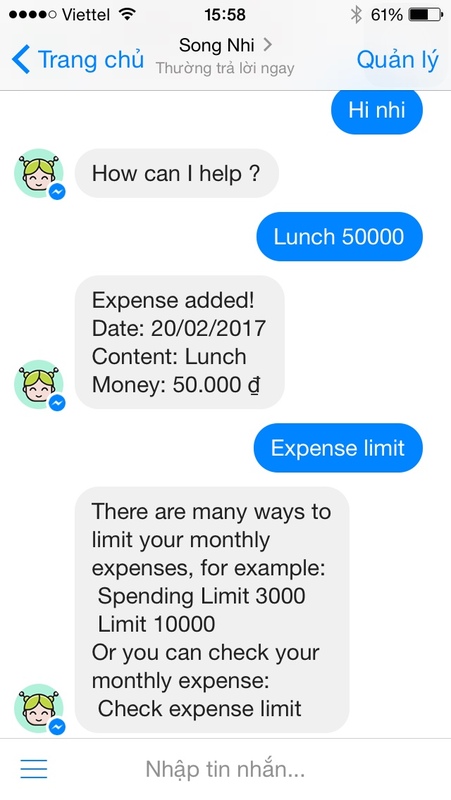 Can a bot help your manage your money? Song Nhi is betting on the answer is yes! No one can argue this fact: Human don’t have as good a memory as bots and there are already enough things to consider when it comes to finances. So stop relying on yourself to remember your financial checklist. Instead, just chat with Song Nhi, Song Nhi will take care of the rest for you. Every time you chat, Song Nhi will gather your information about what you spend on, how much you spend, when you spend, then at the end of the week or month you can ask Song Nhi to report and share insights with you about your spending. Here’s the favorite part: you can set up your spending limit with Song Nhi. Then, you will be warned if you spent more than that amount of money per month. By doing this way, you can learn to save money or build a budget effectively. 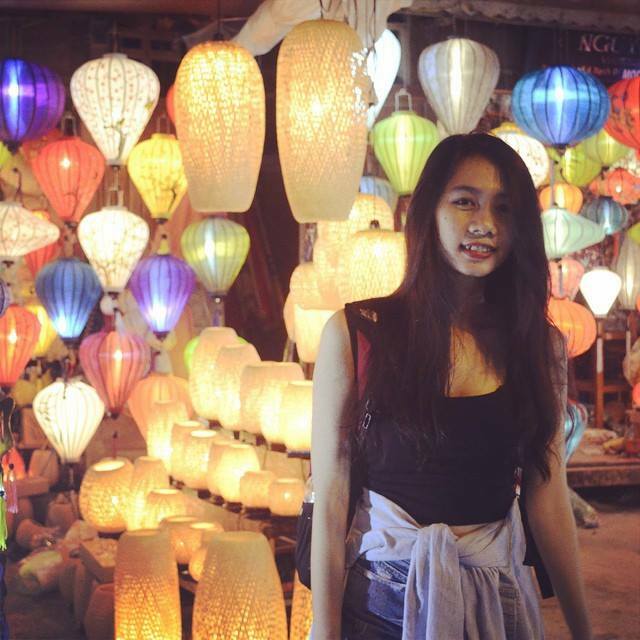 From now on, Song Nhi is learning a lot of of new things everyday to get smarter and faster. All things that help you take the stress out of managing your money. We know it would be a tough road, but it might be an old saying, it still stays true: “No pain, no gain!”. The nice thing is that, when you’ve taken the first step, the second step is much easier regardless of the direction it takes you.